Originally opened in 1999, Beau Rivage Resort & Casino in Biloxi, Mississippi welcomes families to come stay and play along the Mississippi Gulf Coast. 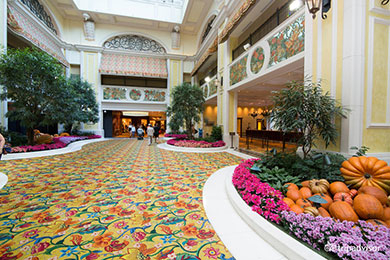 From the moment you and the kids enter the main atrium and lobby, you feel like you’re a world away. 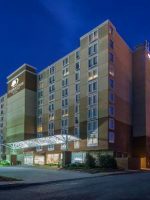 And, with 1,740 guestrooms and suites, 10 restaurants, a swimming pool, an arcade, a live-entertainment theater, the casino and shopping promenade, there’s more than enough for the entire family to enjoy. After the devastation of Hurricane Katrina hit the Mississippi Gulf Coast in 2005, Beau Rivage closed its doors for a $550-million-dollar renovation, re-opening one year later on Aug. 29, 2006. 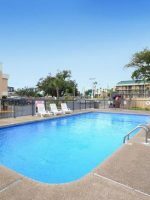 Recipient of the AAA Four Diamond award, the property continues to roll out the red carpet for families looking for a weekend getaway or the annual beach vacation. The majority of guestrooms at Beau Rivage include a flat-screen TV, free Wi-Fi, an iron and ironing board, a bathroom with separate shower and tub, a large vanity, a hairdryer, and bath amenities. Coffeemakers and refrigerators are NOT in all guestrooms. There also are very limited accessible power outlets; in fact, in most rooms, there's only one outlet at the desk. Maximum capacity for all room types is four guests per room. Cribs and rollaway beds are available, but you cannot have both in your room. Floor-to-ceiling windows highlight this 400-square-foot guestroom that has two double beds, a small table, two chairs, a desk with chair, a dresser and a nightstand. This room does not contain a coffeemaker or refrigerator. Overlooking Biloxi, this 400-square-foot guestroom features either one king bed, two queen beds or two double beds, a small table, two chairs, a desk with chair, a dresser and a nightstand. This room does not contain a coffeemaker or refrigerator. Overlooking the Gulf of Mexico, this 400-square-foot guestroom features either one king bed or two queen beds, a small table, two chairs, a desk with chair, a dresser and a nightstand. This room does not contain a coffeemaker or refrigerator. Just like the Deluxe Double Room, but with one king bed instead of two double beds. 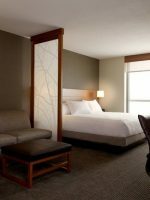 These 400-square-foot corner guestrooms feature windows on two walls that provide views of the Mississippi sound or marina, as well as city views of Biloxi and MGM Park. There's also a small table, two chairs, a desk with chair, a dresser, a nightstand, a 48-inch wall-mounted flat-screen TV, a media hub, an iHome docking station, a Keurig coffeemaker and a refrigerator. Enjoy panoramic views of the Gulf of Mexico from this 400-square-foot guestroom. Furnishings include one king bed, a small table, two chairs, a desk with chair, a dresser and a nightstand. This room does not contain a coffeemaker or refrigerator. 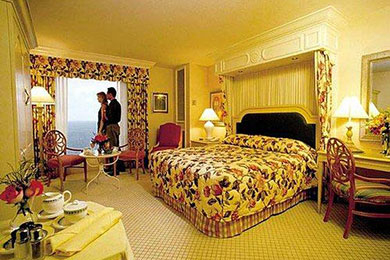 This 500-square-foot guest room offers views of Biloxi and the Beau Rivage Gardens. It contains one king bed, a couch, a credenza, a small table, two chairs, a desk with chair, a dresser and a nightstand. Upgraded features include a wall-mounted flat-screen TV, a media hub with upgraded remote, a Blu-ray player, a coffeemaker and a refrigerator. Enter this 900-square-foot guestroom through the marble foyer, and move into the separate living area with a wet or dry bar. Containing the same amenities as the Deluxe rooms, the separate bedroom has either one king bed or two double beds. In the bathroom, you'll find "his" bath with walk-in shower, "her" bath with a soaking whirlpool tub and custom bath amenities, and spa robes. Outfitted with all the amenities of a Deluxe room, this 1,200-square-foot suite includes a separate living area with marble entrance foyer, wet or dry bar, and dining area. In the bedroom, there is either one king bed or two queen beds, and the bathroom contains spa robes, "his" bath with walk-in shower, "her" bath with soaking whirlpool tub and custom bath amenities. Trip for two... to get away! My wife and I took a chance to visit the Beau Rivage for the first time. We loved every aspect of the place. The view of the ocean, the food variety is awesome. The spa was prefect! The pool was fun and relaxing. Then you can gamble all you want as well. We will bee back! Sooner I hope than later. We enjoyed the room and the gaming floor has an enormous amount of different games to choose from. Wish that we could have stayed longer. You can enjoy yourself not only in the hotel and the gaming floor but it is very enjoyable to walk the shops and the grounds outside! Open daily from 8 a.m. to 8 p.m., the swimming pool reaches a maximum depth of 4 feet. No lifeguard is on duty. Children younger than 16 are not permitted in the pool area without an adult. Towel service is provided, and cold water is available. The pool perimeter is filled with lounge chairs, some small tables and some umbrellas. Poolside gazebos, cabanas and VIP chair experiences are available for rent. Check the pool reception desk for availability, reservations and current rates. Those using musical devices must have headphones or earbuds. Bathrooms are located by the pool bar. If you prefer quiet, head to the sundeck adjacent to the pool area, where you'll find some lounge chairs, small tables and umbrellas. No outside coolers, beverages or food are permitted. The pool bar and poolside cafe offers limited beverages and food items; the poolside cafe is open daily from 11 a.m. to 4 p.m., with the pool bar open weekdays from 10 a.m. to 6 p.m. and from 9 a.m. to dark on weekends. Note: If you plan to order food or beverages and charge to your room, you must have your photo I.D. with you. Open daily from 8 a.m. to 8 p.m., the whirlpool reaches a maximum depth of 3 feet, 6 inches. Children ages 12 to 15 must be accompanied by an adult to use it. Children younger than 12 are not permitted in the whirlpool. This is policed, so don't be surprised if your child is asked to leave the whirlpool if underage. Although there is no beach property directly behind Beau Rivage, guests can reach the beach right next door by taking a short walk along the sidewalk from the parking garage to the beach. There are no facilities on the beach, so be prepared to bring your own towels, chairs, umbrellas, food and beverages if you don't want to spend a lot of time going back and forth between the hotel and beach. If preferred, you can drive over to the beach parking lot. Open daily from 10 a.m. to 11 p.m., this 3,000-square-foot arcade located in the shopping promenade includes a variety of new and vintage games. Think Triple Turn, Pump Up Prime, Ms. Pac Man and Galaga, to name a few. You'll also find games specifically for kids 10 and younger, as well as a cotton candy machine. Note: Children 10 and younger must be accompanied by someone 16 or older, and shoes are required. After 10 p.m., children younger than 18 must be accompanied by an adult. Families can see their favorite musical acts, experience outstanding aerial and dance productions, and enjoy laughs with some of today's best comedians at the Beau Rivage Theatre, a 1,595-seat theater located within Beau Rivage. They even can celebrate the season with special holiday shows held throughout the year. Check the website for current shows during your visit and to buy tickets. 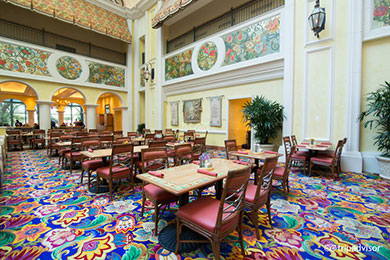 Beau Rivage features nine dining spots that range from casual to upscale to fine dining. In addition, there are three bars. This sophisticated steakhouse offers a menu of chilled seafood, soups, salads, seafood, chicken and, of course, steak. Those steak choices include bone-in Tomahawk ribeye, filet, Delmonico and king porterhouse, among others. Hours: Open Tuesday through Thursday from 5:30 to 10 p.m. and Friday and Saturday from 5:30 to 10:30 p.m. Dress Code: "Smart casual" to the "nines." Enjoy your favorite Pan-Asian dishes at this restaurant, including dim sum, sushi and Teppanyaki, all created with fresh vegetables, seafood and meats like chicken, beef and duck. Hours: Open daily from 5 to 11:30 p.m. Dress code: Casual. Italian fans will love this relaxed restaurant, where they can enjoy such traditional dishes as spaghetti, fettucini and lobster ravioli. Pizza, seafood, steaks and chops also are available, along with a selection of starters, soups and salads. Hours: Open Wednesday through Sunday from 5:30 to 11:30 p.m. Dress code: Casual. Serving breakfast, lunch and dinner, this all-you-can-eat restaurant features a wide variety of choices sure to satisfy every appetite in your family. Specialty dinner menus are available Thursday through Sunday. Hours vary. Dress code: Casual. If you love sports bars, this pub-style eatery will be right up your alley. The menu features all your favorites, like burgers, pizza and oysters on the half shell. Hours: Open Monday, Thursday and Friday from 5 to 9 p.m. and Saturday and Sunday from 11 a.m. to 9 p.m. Dress code: Casual. Day or night, grab breakfast, lunch, dinner or a late-night snack from this casual dining spot. Think pancakes and eggs, a sandwich and chips, or a plate of pasta. Hours: Open 24 hours. Dress code: Casual. Just as the name implies, you can grab a sandwich, salad or hot dog as you head to your room. Or, take a seat at a table and watch the action in the casino as you eat. Hours: Open Sunday through Thursday from 11 a.m. to midnight and on Friday and Saturday from 11 a.m. to 2 a.m. Dress code: Casual. Wake up or refresh with your favorite cup of Joe or hot tea accompanied by a sweet pastry or light bite as you people watch from the "patio." Hours: Open Sunday through Friday from 6 a.m. to 11 p.m. and Saturday from 6 a.m. to 11:30 p.m. Dress code: Casual. Indulge your sweet tooth with a scoop of decadent ice cream, frozen yogurt, a milkshake or a smoothie. Hours: Open Sunday through Thursday from 12 to 10 p.m. and Friday and Saturday from 12 to 11 p.m. Dress code: Casual. Note: Vending machines are located on floors three through 25 next to the center elevator foyer. You must have your room key to access the vending area. All machines accept $1 and $5 bills. 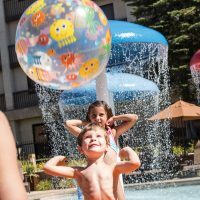 Check-in is at 3 p.m., and check-out is 11 a.m.
At the front desk, you'll find a brochure titled "We Care About Your Children," which outlines the hotel policies regarding children. These include familiarizing children with hotel security personnel, escorting children through gaming areas, and escorting children in non-gaming areas. It is imperative that parents pick up and read this brochure carefully. Exclusively for Beau Rivage guests, the Tom Fazio-designed Fallen Oak is an 18-hole, par-72 golf course located approximately 14 miles from the hotel. Tee times and transportation can be arranged through the front desk. Open daily, Beau Spa & Salon offers a full menu of massages, body treatments, nail services and salon services. Open daily from 5 a.m. to 9 p.m., the fitness center contains a number of cardio machines, as well as a large selection of free weights and weight machines. Towel service and water is available. 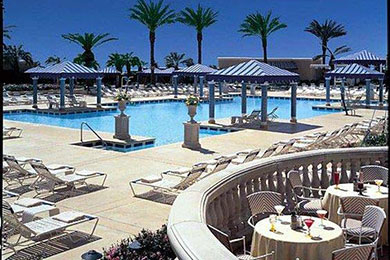 As a beach destination, Beau Rivage Resort & Casino in Biloxi hosts a lot of visitors from spring through Labor Day. 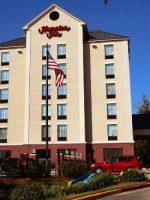 Thanks to its location and relatively mild weather, the hotel continues to see a lot of guests from fall through spring, but you will find better rates and lower occupancy during these months. 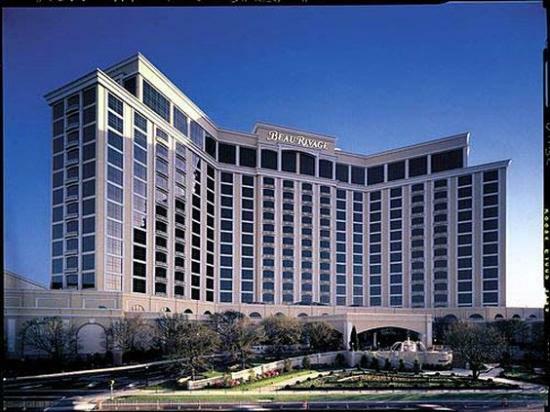 Beau Rivage Resort & Casino is served by Gulfport-Biloxi International Airport (GPT), which has service with three major airlines: American Airlines, Delta and United. Airport transportation can be arranged through the hotel for a fee. For those driving to Biloxi, take Interstate 10 to Interstate 110, which ends at Highway 90 right next to Beau Rivage. 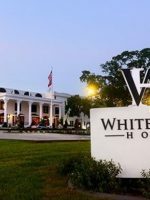 Traveling around Biloxi does require a car given that attractions, dining and shopping are spread throughout the area. If you need a rental car, Beau Rivage can assist you with this service right onsite. At most places, there is free parking, and free parking also is found along Highway 90 for beach-goers. When driving, you'll notice there are numbered blue shrimp signs attached to traffic light poles. These numbers provide guidance on where to find specific businesses. Stop by the Biloxi Visitors Center or Visit Mississippi Gulf Coast visitors center to pick up a "Dining and Attractions Guide Book." Each listing contains the businesses' relevant traffic light number. For guests interested in public transportation, the Coast Transit Authority offers reliable bus services with standard fares of $1.50 for adults, $1 for children ages 6 to 14, and free for children age 5 and younger. The CTA's Casino Hopper route has a stop right in front of Beau Rivage, and can take you to several of the area's top attractions. Also with a stop right in front of Beau Rivage, the Beachcomber route transports visitors to and from some of Biloxi's most popular attractions as well. 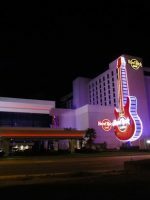 If parents are able to sneak away from the kids for a bit, head to the Beau Rivage Theatre for some musical entertainment or go the casino and face down Lady Luck. Or, enjoy some pampering at Beau Spa & Salon before sharing a quiet dinner for two at BR Prime. Wrap up the evening with a nightcap at Coast Nightclub.